Detroit has been one of the cities hit hardest by the Great Recession. 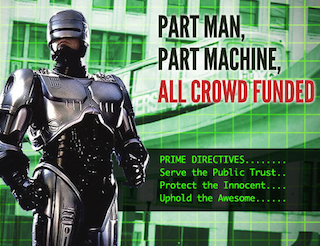 But a new project hopes to lift Motor City’s spirits in the most awesome — if completely ridiculous — of ways: By building a sweet RoboCop statue. The exchange was posted to Reddit, where it got the kind of attention an idea like this truly deserves. And since this is the Internet, after all, Mayor Bing’s rejection became merely the beginning of a new campaign to make the RoboCop statue a reality. Detroiter John Leonard took the idea to a new level when he started a Facebook event page, Build a statue of RoboCop in Detroit, which currently has more than 4,500 RSVPs. The movement was pushed further forward through collaborative start-up generator Kickstarter. So far, the campaign amassed nearly 300 supporters who have provided more than $6,700 toward the cause. The campaign needs at least $50,000 by Saturday, March 26, for the statue to be built. The Kickstarter campaign is run by Detroit-based non-profit Imagination Station, which owns a number of properties in the city. If the campaign is successful, the RoboCop statue will be built on an Imagination Station property on Roosevelt Park, which faces Detroit’s iconic (though completely abandoned and run-down) Michigan Central Station. Anyone who wants to help turn Detroit’s frown upside down and help make this cyborg dream come true has 43 days left to donate, and help uphold the awesome.